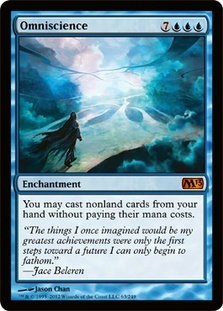 Monday Morning Magic (The Gathering): Prereleases for Magic 2013 are this week! Prereleases for Magic 2013 are this week! I know... I really let June slide. I didn't have much to say and have been a bit busy, so I neglected this blog. I'm still alive, and I'm going to look at M13 in this post. What will I evaluate? The products that will be released, the promos, and the most expensive cards (as released thus far) via StarCityGames.com. The Booster Box: 36 packs of 15 cards each. Typically you can get it for around $100, give or take about $15. I've seen them for $85, and I've seen them for $115. If you look at the $100 typical value, each card in each box is about 19 cents each, disregarding rarity. Each pack is also worth about $2.78, so a booster box is the best value for you if you like opening boosters. The Fat Pack: 9 booster packs, 80 basic land cards, a large 400 card box, 2 small deck boxes, a spindown life counter, and then a player's guide with a visual encyclopedia of each card in the set. A very good buy at about $30 or $35. The Intro Packs: Of the five intro packs, there is a foil rare legendary creature in each one. Despite the outside packaging indicating a sole color, it is believed that they are dual colored, but this has not been released yet. Additionally, the MSRP went up to $15 instead of the $13? intro packs used to be. This is done because these intro packs contain 2 booster packs now instead of one. Deck Builder's Tool Kit: As the previous two versions have evidenced, you get random sets of cards with commons and uncommons from the previous couple of sets and the core set and a basic land pack. You'll also receive four booster packs. 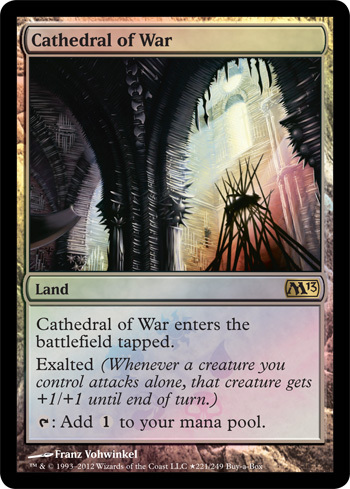 This one will most likely have an Innistrad booster, a Dark Ascension booster, an Avacyn Restored booster, and then an M13 booster. Xathrid Gorgon is the promo for the prerelease event. 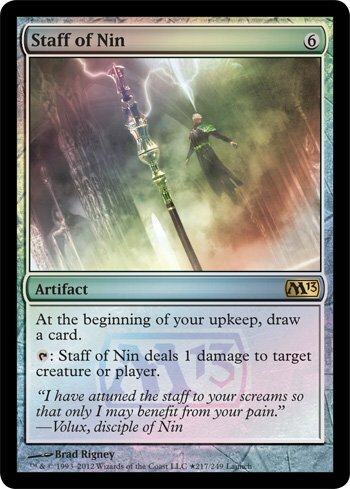 Staff of Nin is the FNM release promo. 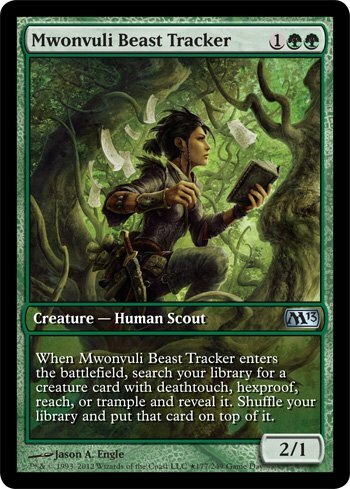 Mwonvuli Beast-Tracker is the Game Day promo everyone receives. 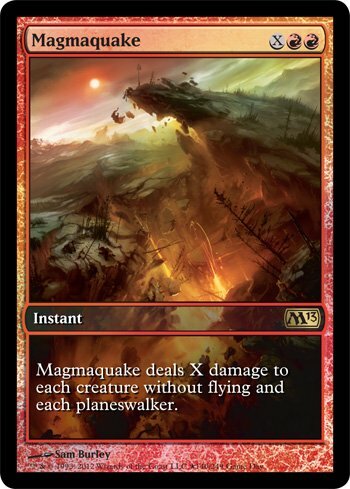 Magmaquake is the Game Day promo that the Top 8 receive. 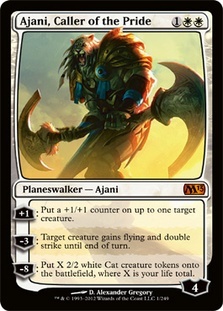 Ajani, Caller of the Pride is one of the two newest planeswalkers. This is the third version of Ajani, which fits with how Garruk, Jace, and Chandra are all in their third versions currently. Ajani goes for $40 currently. Akroma's Memorial is a really cool card to have for any deck if you don't want burn and kill spells hitting all your creatures. This also provides a great offense with the vigilance, trample, first strike, haste, and flying offered by this card. This is currently $10. Jace, Memory Adept is a reprint from M12 and is interestingly cheaper in M13 than the current M12 (which is pictured as the M13 image isn't out yet). 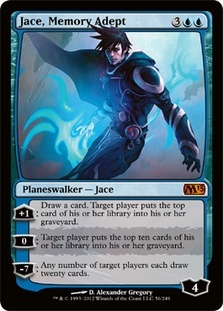 Jace is $10 right now. Liliana of the Dark Realms is the other new planeswalker, getting her third version with M13. 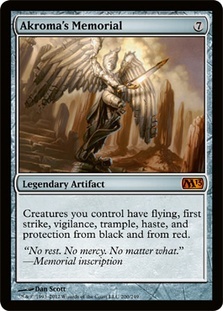 Looks like this will be a great card for anyone who runs black and particularly Griselbrand or other high cost demons. Omniscience looks like a really good card. Unfortunately, of course, it costs an expensive 10 mana to cast, so it may not wind up seeing play in any games or tournaments as much is my prediction, but, then again, someone always finds a way to get cards out faster than the casting cost allows. Hell, I even got a Griselbrand out with only four land using a Grimoire of the Dead. Omniscience is currently $10. Sublime Angel appears to be a good card giving each creature you have exalted and being of a relatively low casting cost. Currently the price is $20. 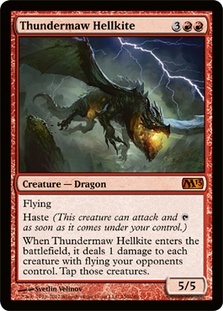 Thundermaw Hellkite looks to be an awesome card killing an X/1 flyer an opponent controls when it enters the battlefield and tapping all the others allowing you to use the haste on it to attack your opponent directly for 5 damage, unless, of course, an opponent has a creature with reach. Currently costs $20. 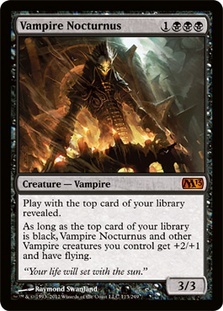 Vampire Nocturnus can give any vampire +2/+1 with flying if the top card of your library is black. This would work great for a mono black vampire deck. Personally, I might throw in a bit of red to use from of the vampires in the Innistrad block. Everything so far from this set is looking awesome and I cannot wait to get started with it. We have 6 planeswalkers in this set with Nicol Bolas as one of them. His planeswalker has not changed at all since Conflux, so if you still have one, you are good to go. Even if you have a foil alternate art one from the Ajani vs. Nicol Bolas Duel Deck, you are also good to go. As a tip, if you want Nicol Bolas, my Walmart currently has about four Ajani vs. Nicol Bolas Duel Decks in stock, each for $20, so you could easily go and pick up a Nicol Bolas now if you want to use him in a deck on release day.